The Kettle Creek Battlefield Association, Inc. (KCBA) recently signed an agreement for development of a conceptual plan for a Kettle Creek Battlefield Park. The plan would be developed by the Carl Vinson Institute of Government, University of Georgia (CVIOG), and was signed by Walker Chewning, president of KCBA and Jere Morehead, president of the university. Dwight Harley of Lincolnton made two very generous donations to the Kettle Creek Battlefield Association (KCBA) in Wilkes County, which eventually netted a total of $27,000 for the organization. Harley contributed $5,000 in cash and $8,500 in Plum Creek Timberlands stock, provided both amounts could be matched. Walter Cook, a trails-developing forester, studies requirements for handicap-access trails before tackling a route for the Summit Trail in the Kettle Creek Battlefield. On his fourth trip to the Kettle Creek Battlefield site, Walter Cook, PhD, spent a recent morning on the Summit Trail. In earlier visits, he refined positions of the War Hill Loop Trail which Allen Burton, Joe Harris, and Richard McAvoy’s county crew had cleared. Cook, retired from the UGA Warnell School of Forestry and Natural Resources, has located and designed more than 80 hiking and interpretive trails in Georgia and South Carolina. “It is what I like to do in retirement,” he said. He used a machete to hack his way through blackberry thickets and other undergrowth on earlier visits under 100-degree conditions. The two highest priority trails, identified by the Kettle Creek Battlefield Park Master Plan, are now open and identified for hiking, having only a few rough spots. The War Hill Loop Trail is less than half a mile and the Summit Trail is somewhat longer. The Loop Trail provides a view of Kettle Creek, all sides of War Hill, and allows a review of battle events and topography. It is rich in natural history. Public school lesson plan developers Katy Meeks and Al Dawkins toured the trail. With adequate clearing to the west, the Summit Trail will offer a panoramic view of both Settlement Hill and War Hill. Thus, it is an easy visitor experience of the troop movement from the Hammett Settlement and battle sequences as the engagement moved southward to what is now New Salem Church Road. The battlefield development project involves a partnership between the Kettle Creek Battlefield Association, Inc. and Wilkes County. It envisions economic development based on the rich history of Wilkes County and the city of Washington. 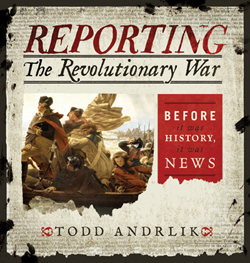 It is supported by funding from Federal, state, and local sources as well as that of many private organizations and individuals who value the lessons of history. Great News from Wilkes County! Kettle Creek battle site expands with KCBAâ€™s 60-acre purchase. Kettle Creek battlefield group gets support from state SAR. Small Skirmish in the War for Freedom. Frontier fort from Revolutionary War found in Ga.
Frontier fort from Revolutionary War found in Ga..
And freely released to the general public in two weeks. I guess a little got lost in the translation. Carr’s Fort is in Georgia, not Virginia. A version was posted in the e-zine PastHorizons.com in England yesterday. Russ Bynum’s Associated Press story appeared in well over 300 media outlets in the U.S., as well as Algeria, Ghana and Australia. And probably hundreds more that I am not aware of. Search for Revolutionary War fort here recalls Wilkes families frontier history. 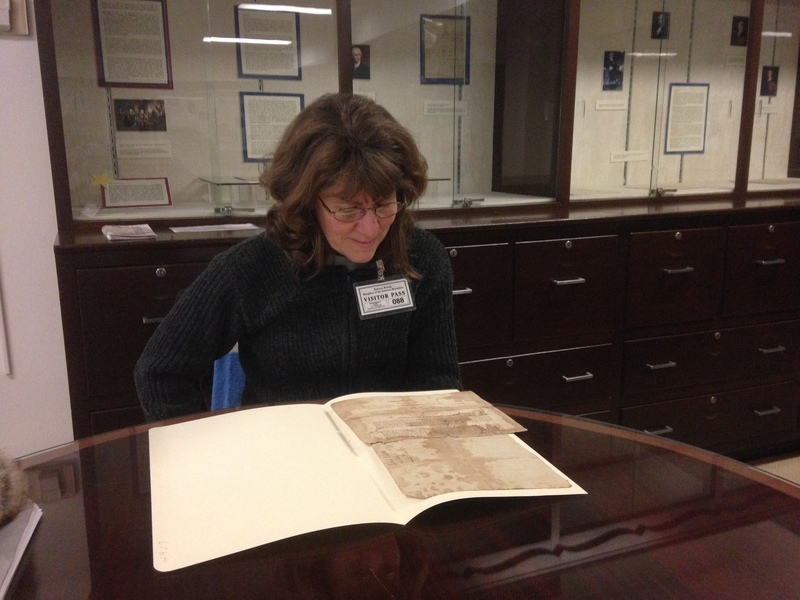 Archaeologists searching for long-lost Wilkes fort, Revolutionary-era items. 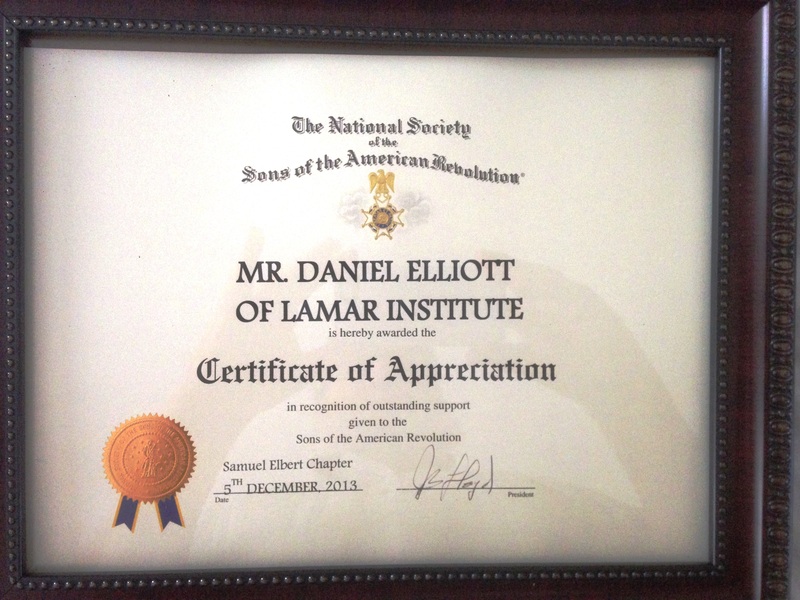 DONATE TO LAMAR INSTITUTE–Support Our Research for 2013! Get Your Archaeology Books? Support Archaeology! Crowfield and Broomhall were two 18th century Goose Creek rice plantations in Berkeley County, South Carolina. In 1987 Garrow & Associates, Inc., under my direction, conducted archaeological survey of both plantations for Westvaco. The work was underfunded and fast paced. Concurrent work at Broomhall, directed by Steven Byrne was never fully documented. After I completed the survey report, we were contracted to prepare a National Register of Historic Places nomination for Crowfield Plantation. This document was completed and submitted to Westvaco, who promptly filed it away and it was not submitted. That ended the Garrow & associates chapter of Crowfield and Broomhall research. Major portions of these two important and unique 18th century treasures were subsequently trashed by the development project. The other reports by Chicora Foundation are available through Interlibrary Loan. Advances on the Internet have provided easy access to additional information on Crowfield, Broomhall, and the Goose Creek plantations. For example, Leiding’s 1921 Historic Houses of South Carolina is available from Books.google.com as a .pdf. It includes a discussion of Crowfield. N. B. A few errors, attributable to hurried preparation for the press, occurred chiefly in the notes to our first number. In note on page 210, paragraph 7, line 1st., for “Isaac Marion, his brother, settled in Georgetown, at least as early as 1742,” read “Isaac Marion, the General’s eldest brother, married and settled in Georgetown, at least as early as 1742.” In note on p. 217, line 2d., for “Mrs. Sarah Cutler, of New-York,” read “Mrs. Sarah Cutler, of Massachusetts.” In note on p. 215, par. 2d. line, in relation to the present ownership of Crowfield, for “but now the property of Mrs. Middleton Smith,” read “but now the property of Henry A. Middleton, Esq ” We were led into this error by confounding Crowfield with Bloomfield, the adjoining plantation of Mrs. Middleton Smith. In line 34 of same note, for “Dr. Geddings’ map of Crowfield,” read “Dr. Geddings’ map of ‘The Elms. '” Crowfield was originally the property of the Hon. Arthui Middleton,* who conveyed it Nov., 11,1729, to Wm. Middleton, who, it is said, had a country-seat of the same name in England. During the revolutionary war, he sold it to Rawlins Lowndes, Provost Marshal under the colonial government, and President of the State of South-Carolina after the Declaration of Independence. After six years’ possession, Rawlins Lowndes, and Sarah, his wife, on the 16th March, 1784, conveyed it to John Middleton, whose heirs sold it to the present proprietor. It is said to be a place of great beauty, presenting numerous remains of the great labour and lavish expenditure of money, which the wealthy colonial planter bestowed on his villa or country-seat, when the law of primogeniture gave us a landed aristocracy and kind of hereditary nobility. It is no longer in cultivation ; but it is well worth the visit of the antiquarian, and of all who delight to recal the memories of the past,—and especially the grandeur and magnificence of colonial times. R. Y. * We find on record an indenture of lease and release, dated November 10 and 11,,1729, between the Hon. Arthur Middleton, of Berkley county, and William Middleton, of the same county, by which deed the former conveyed to the latter two tracts of land in the Parish of St. James’, Goose Creek—the one containing one thousand four hundred and forty acres, (Crowfield,) bounded north and northwest on lands of Matthew Beard and Andrew Allen, south on lands of Benjamin Marion, west on lands of Mr. De La Plain, deceased, east and south-east on lands of Thomas Moore and Benjamin Gibbs: the other containing 103 acres in said parish, bounded north-west on land of Mr. De La Plain, deceased, northeast and south-east on land of John Gibbs, and south on land of Francis Guerrin. The Will of Arthur Middleton, of Berkley county, is dated June 7,1734, and proved Dec. 7, 1737, before William Bull, Governor. It mentions his wife Sarah, and his sons William, Henry and Thomas,—and devises, inter alia., half of his lot No. 199, in Charlestown, to his son William, to be divided lengthways, and the other half to his son Henry; and his brick tenement and part of his lot, bought from Andrew Allen, to his wife. The witnesses to the Will were Tim Mellichamp, Jane Mellichamp and Thomas Corbett. Staff report, Post and Courier, Charleston, S.C.
Crowfield Plantation Community Service Association manager Missey Lewis (left) stands with Goose Creek Mayor Michael Heitzler in front of the new historical marker outside the Bloomfield subdivision. The land that became Broom Hall was granted to Edward Middleton in 1678 and later conveyed to Benjamin and Jane Gibbs. When Benjamin died, the land was left to Jane, who later married Peter Taylor, who developed the estate until the mid-18th century. The property was later owned by the Smith family and their descendants, who rented sections to freedmen after the Civil War. The West Virginia Pulp and Paper Co. used the land to harvest pine trees in the 20th century with the property finally being developed residentially after 1980. A historical marker noting the site of the former Broom Hall plantation was erected in Crowfield Plantation. The marker can be seen in the small park off Westview Boulevard near the Bloomfield neighborhood. “The Crowfield Plantation Community Service Association is proud to share in this great endeavor with (Goose Creek) Mayor (Michael) Heitzler in educating and recognizing the historical value of our great city,” association manager Missey Lewis said. A team of garden archeologists, wielding root clippers, trowels, and whisk brooms between the 14th and 17th fairways, was investigating what has come to light as the earliest picturesque, or natural, landscape garden in America. Twelve miles north of Charleston, the 23-acre garden was created at Crowfield Plantation by William Middleton in 1730. The land, including the golf course, is owned by the Westvaco Corporation, the paper packaging and chemical company. Crowfield’s extensive ponds and canals predate by 10 years the famous green, stepped terraces and butterfly lakes of Middleton Place, the nearby garden that belonged to William Middleton’s younger brother, Henry. William Middleton eventually inherited the family’s property in England and returned there in 1754. Thereafter, Crowfield was sold to a succession of mostly absentee landlords. Crowfield’s survival, even overgrown, was partly due in this century to its inaccessibility along back logging roads cloaked by 2,850 acres of swampy timberland that Westvaco bought in 1930. Westvaco eventually decided to build a planned community for an estimated 15,000 people around Crowfield. For the future homeowners to qualify for Federal Housing Administration financing, Westvaco was required in 1986 by the National Historic Preservation Act to make an archaeological survey of the site. William Middleton was 19 years old in 1729 when his father gave him the 1,500-acre plantation that was named for Crowfield Hall, the family’s English seat in Suffolk. The Middletons, who were prominent in colonial government, were part of the Charleston community that had originally been sugar planters in Barbados in the 17th century. Born in the American colony, William cultivated the rice that was called Carolina gold because of the high rate of return that made the low country planters so wealthy. In May 1743, on a visit to Crowfield, Eliza Lucas, a young colonist who pursued an interest in local agriculture, described the garden at its height in a letter to a London friend. She wrote of the plantings, the perspectives, and the “large fish ponds properly disposed which form a fine prospect of water from the house.” This letter, the only reliable documentation of the way the garden appeared at the time, has been crucial to the restoration project. Massive oaks draped in Spanish moss still line the old avenue to the ruins of the plantation house. The moon pond at the entrance, 200 feet in diameter, lies just before the house. The house was abandoned in the early 1800’s, and it has succumbed over the years to fire and earthquake, as well as vandalism to its handsome Flemish-bond brick work. Some old magnolia trees are positioned behind the house near the section of the bowling green that has survived the golf course; in all, about eight acres of the original gardens were lost to development, the archaeologists’ report said. And in the middle of the wilderness area, which may have had symmetrical plantings, a 15-foot-high hill, or viewing mount, indicates that the garden’s features like the ponds and the terraces were meant to be surveyed from above. All of these features are more visible now, after Hurricane Hugo felled many trees in September 1989. The “fish ponds” that terminate the view are more precisely a central rectangular lake, framed on three sides by long canals. “There are few, if any other, gardens in America with authentic mounts or canals,” said Rudy J. Favretti, a consultant on historic landscapes from Storrs, Conn. It is conceivable that the ornamental lake and canals were also part of a system to irrigate the rice fields. In particular, Crowfield’s plan, which included a Roman temple, resembles such English landscapes of the late 1720’s as the water garden at Studley Royal in Yorkshire or the bowling green and serpentine walks at Claremont in Surrey. In the most recent stage of garden archeology, conducted in April by Michael Trinkley of the Chicora Foundation, a non-profit heritage preservation organization, Westvaco acted with the advice of its consultants, Hugh and Mary Palmer Dargen, Charleston landscape architects who specialize in historic preservation. During this dig, the team analyzed earth berms that elevated the garden and separated it from the cultivated fields. Team members were also able to determine areas where shallow top soil indicated grassy areas rather than deeply rooted flower beds. Current plans call for the garden to be turned over to the homeowners’ association when the houses encircling the golf course are completed. But Charles Duell, a Middleton descendant and president of Middleton Place Foundation, said he hoped that Westvaco would “donate a conservation easement on the property” to a consortium of preservation groups. This group could then control further archeological research and restoration. So far, the site has been open only to researchers. Although Crowfield is now only a beautiful ruin with classic water features, it is evidence of how the first settlers transported high style to the New World. “It is the Mona Lisa of early American landscapes,” Mr. Poston Said. Sir Christopher Prevost and Daniel Elliott escorted their ladies to Sheldon Church on this fine day. A few images of this outing are shown below. Archaeologist Dan Elliott displays some of the artifacts his teams have found at Kettle Creek during the recent dig. A group of archaeologists and historians have spent several days recently looking for missing pieces of the Battle of Kettle Creek puzzle, and they think the public can help them with the puzzle, too. A team of archaeologists, historians, and students braved heat, thick woods, and impassable stands of thistles to explore the land around War Hill on a four-day fieldwork session June 12-17, hoping to locate artifacts from the Revolutionary War battle and, piece by piece, expand their knowledge of the battle. 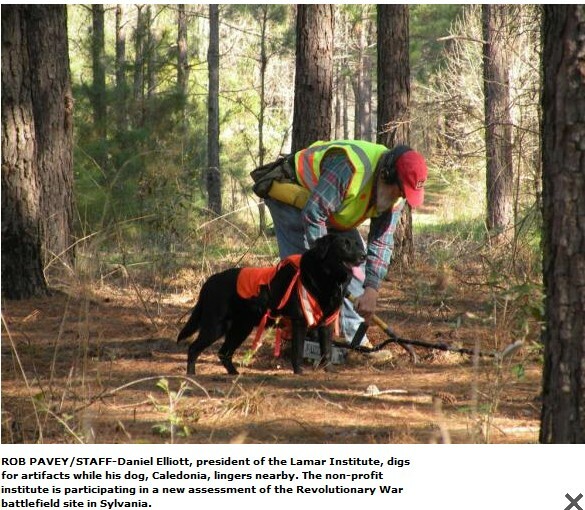 On a previous visit to War Hill, archaeologist Dan Elliott of the Lamar Institute, Inc., and his teams had used metal detectors to find bullets and other metal objects that might have been left during the 1779 battle. They found some 32 possible battle relics, including round balls of smaller caliber bullets – buck-and ball load for non-military muskets. They also found, and recycled, modern artifacts including 15 pounds of shotgun shells, .22 shells, and beer cans. Geo-referencing locates exactly the fall of bullets, for example, shot and unshot, to map exactly where the militia soldiers actually were during the battle. To share information on old Kettle Creek finds, contact the City of Washington’s Main Street Manager David Jenkins in the City Hall Annex, or call 706-678-4654. Mark Pollard, left, and Mike Benton search last month at the 1779 battle site in Wilkes County. A fragment from a Revolutionary War musket ball. Items discovered during archaeological digs at Kettle Creek are tracked with GPS coordinates so that clashes can be reconstructed later. The battle near the Wilkes County town of Washington pitted Loyalists against Patriots. 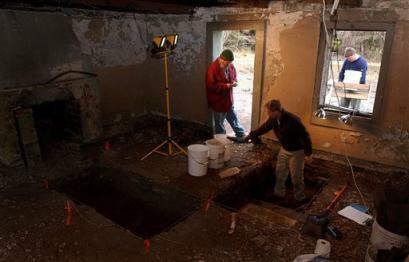 WASHINGTON – An archaeological dig in Wilkes County has opened a 229-year-old window to one of the pivotal points in the early years of the American Revolutionary War – and there’s evidence that it’s not exactly the way the history books tell it. For centuries following the Feb. 14, 1779, battle at Kettle Creek, stories passed down through the generations pitted 350 Patriots against 700 Loyalists on only 12 acres of land. But archaeologists have found evidence that the three-hour running battle stretched over at least 500 acres of property surrounding the traditional site where a monument and cemetery now stand. Nine men and women working with The LAMAR Institute, a Savannah-based nonprofit archaeological research organization, last month unearthed dozens of musket balls, buttons, pieces of weapons and evidence of small farmsteads during a five-day dig on the 500 acres of property. 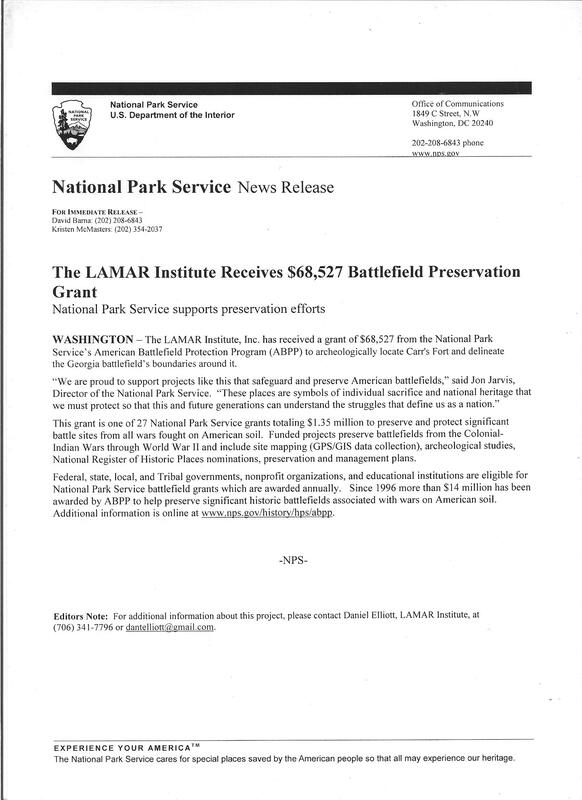 The study, funded through a $40,000, two-year grant from the National Park Service and the city of Washington, could lead to plans for a battleground park, city officials have said. Each discovery in last month’s dig gave researchers a look into the day when the militiamen routed twice their number in new British recruits and made Southerners think twice about staying loyal to the Crown. And neighbors were definitely part of the battle – even if they didn’t want to be involved. Evidence of at least three farmsteads – hand-wrought nails, collapsed chimneys and horseshoes – were found during the dig about 500 feet south of the battlefield monument, along with a few musket balls. “Right now, we’re getting a rough idea of what life was like for people when this battle was raging on around them,” Elliott said. The Patriots lost only seven men in the Battle of Kettle Creek, but dozens were injured and taken to a location north of War Hill – the traditional battlefield site – for treatment, researchers found. Archaeologists found evidence during the dig to back up their theory about the location of this field hospital. At least 18 buttons, likely from clothing that was ripped off men in order to treat their wounds, were found in one concentrated area – an unlikely discovery in an area that over the years has been picked over by artifact seekers, Elliott said. The Kettle Creek battle was a vicious fight between Loyalists recruited by Col. James Boyd in South Carolina to fight on the side of the Crown and Patriots who were not ready for Georgia to be claimed by the British. Historical accounts of the battle say an army led by Col. Andrew Pickens, Col. John Dooly and Lt. Col. Elijah Clarke tracked Boyd on his way to Augusta as he circled around through Wilkes County to avoid a Patriot army encamped on the Savannah River. Pickens split his men into three groups and tried to sneak up on Boyd’s recruits while they camped at Kettle Creek, but scouts saw them. Boyd was able to muster about 100 men to meet Pickens’ 140 at the top of a steep hill. Boyd was mortally wounded, causing the new troops to panic and retreat back to the camp. 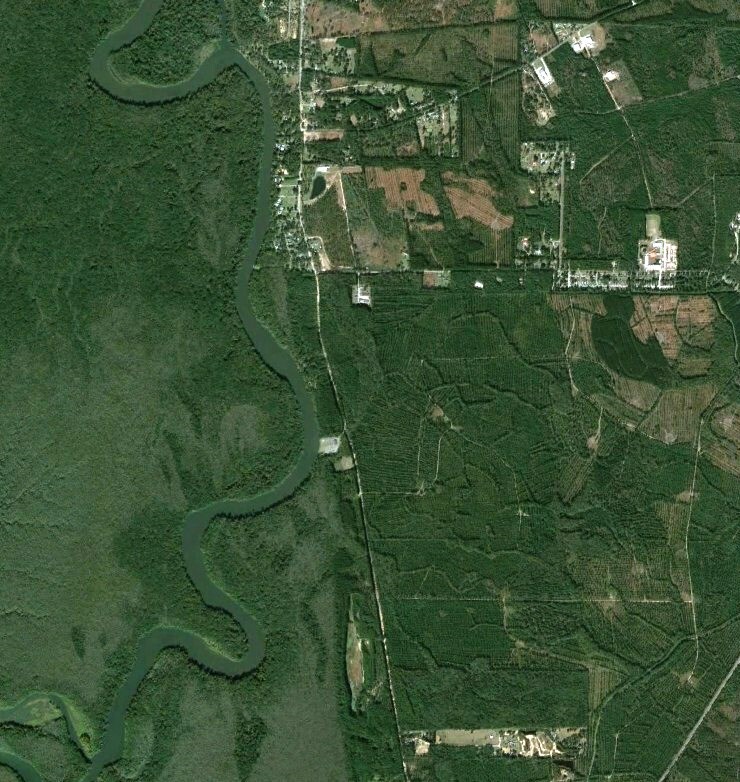 Dooly was stuck in a canebrake on one side of the camp, but Clarke charged in from the other side. In the end, 20 Loyalists were killed and 22 taken captive. About half the rest went back to South Carolina and the other half went on to Augusta, Elliott said. Archaeologists believe they found the location of the Loyalists’ last stand. Southwest of the traditional battlefield, metal detectors uncovered musket balls and musket ball fragments from a secluded hill off of Salem Church Road. The fragments likely are evidence that musket balls hit trees as the loyalists crouched behind for protection, said David Battle, assistant director of the LAMAR Institute. 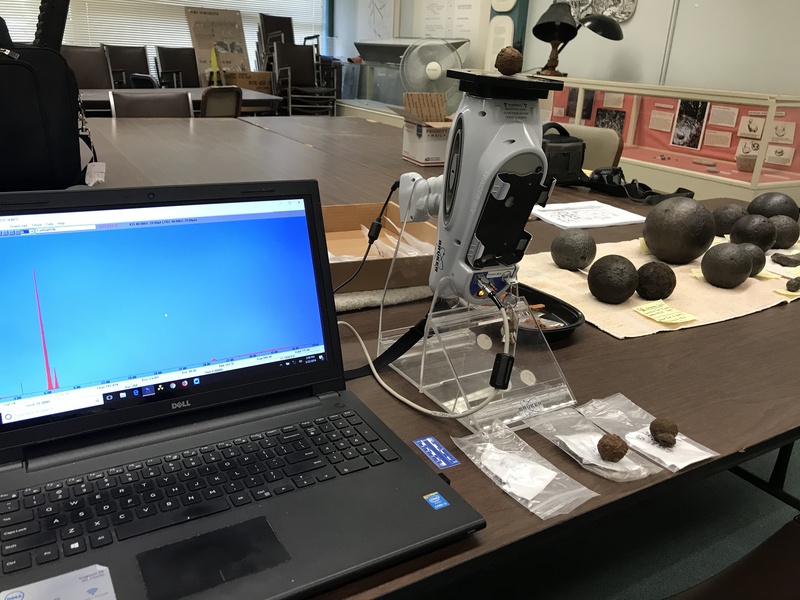 Researchers hope to label the musket balls as Patriot- or Loyalist-owned by determining the caliber and amount of lead found in each bullet, Battle said. The rough terrain obviously was no problem for the Patriots, he said. Elliott said researchers likely will release an officially report of the team’s findings later this year. The LAMAR Institute’s archaeological team completed fieldwork of the Kettle Creek Revolutionary War battlefield this week. Now the fun part begins, washing, analyzing, mapping, etc. We found several areas related to the battle over about a 1,000 acre or more area. It was a dizzying assortment of metal detectors, GPS and GPR devices and bug spray. The ticks were only moderately bad and we only saw one copperhead and it was dead. A report is due in November. 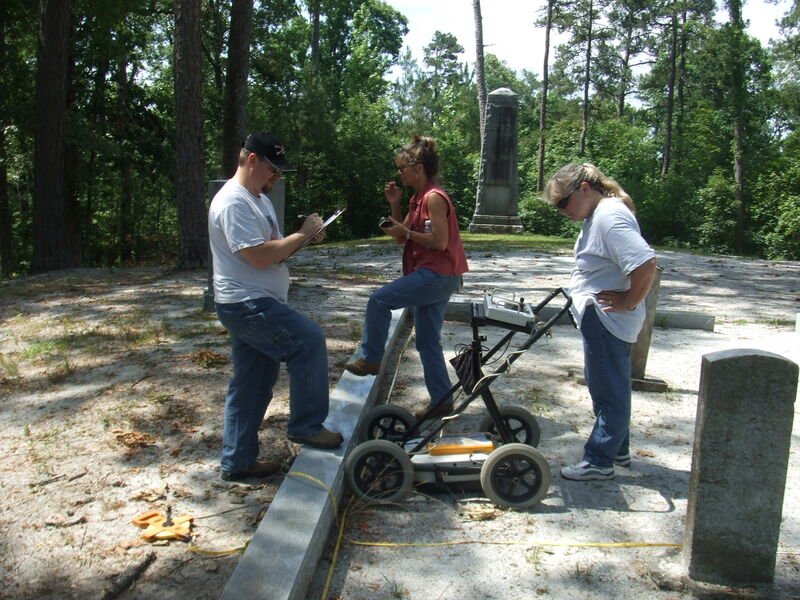 I have attached a photo of folks surveying a Revolutionary War cemetery with the GPR equipment. Shown here are project volunteers, Sheldon, Judy, and Gail. The cemetery, which was created in the 1970s, contains mostly cenotaphs and relocated grave markers but the GPR survey should indicate which markers are truly grave markers. At this year’s spring meeting of The Society for Georgia Archaeology (SGA), Thomas H. Gresham was presented the Joseph R. Caldwell Award for outstanding service to Georgia Archaeology. 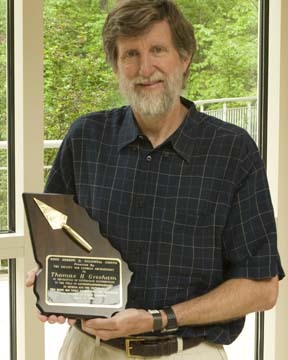 The Caldwell Award recognizes those individuals dedicating a noteworthy amount of time and energy toward supporting an archaeological project; making outstanding contributions in the area of public education and Georgia archeology; and providing substantial support for SGA and its programs over time. 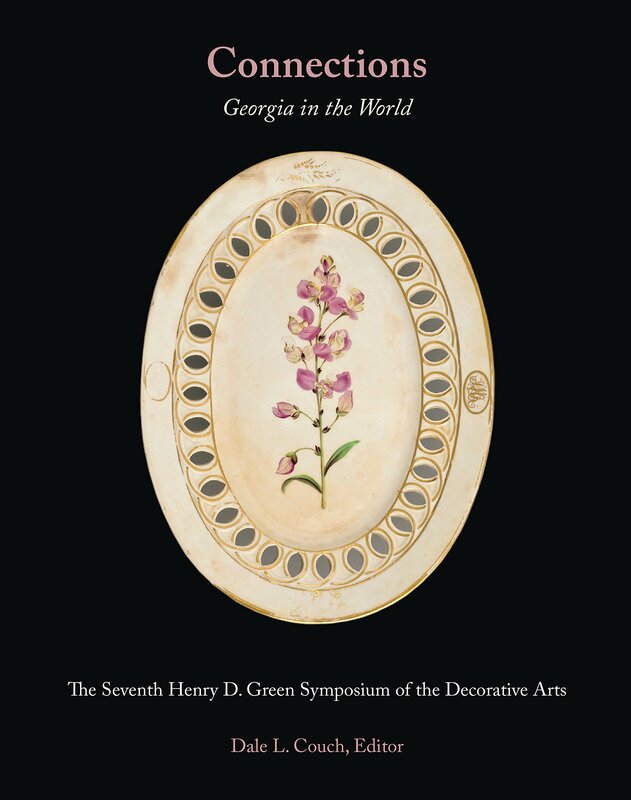 Mr. Gresham has been dedicated to preserving the history and prehistory of Georgia and making that information available to the public, often by donating his time and expertise, often behind the scenes, for the past thirty years. 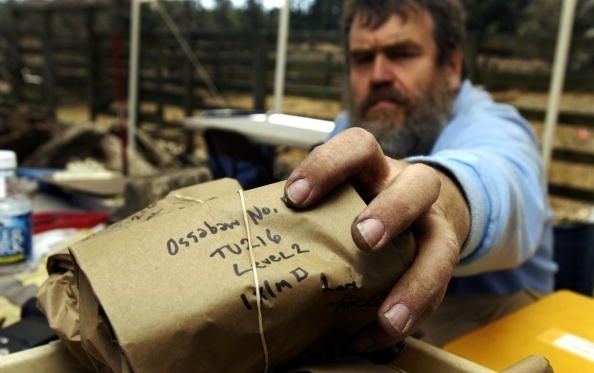 As a principal in Southeastern Archeological Services cultural resource management firm, Tom has performed archaeological investigations in an ethical and professional manner, resulting in the identification and protection of hundreds of sites in Georgia. He has also pursued research interests such as his investigation of historic rock piles and aided in interpretation of these sites. An Eagle Scout, he has volunteered with the Boy Scouts of America in investigations around Clark Hill Reservoir as well as made numerous presentations to school groups, library groups, and others to raise awareness of Georgia’s archaeological resources. 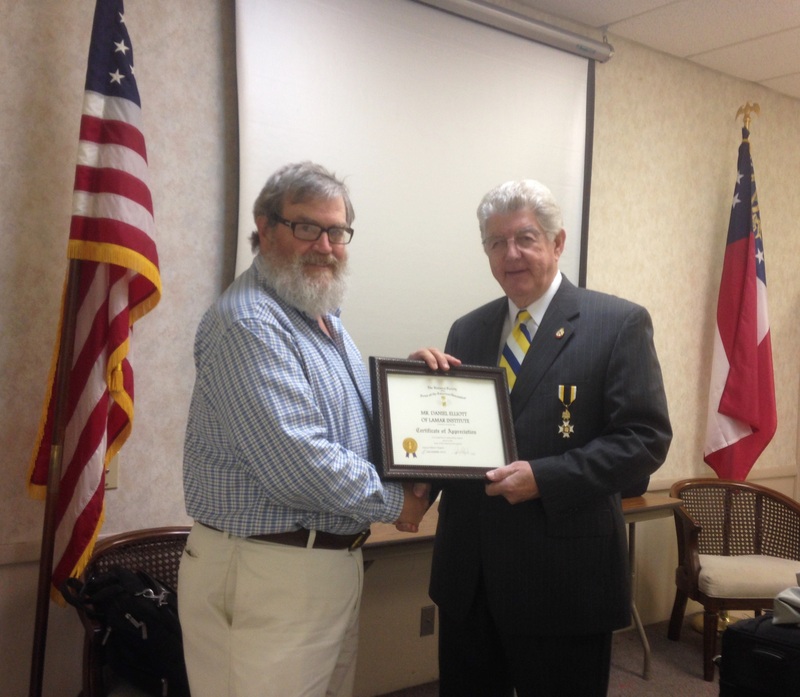 He is past President of the Georgia Council of Professional Archaeologists, long time officer and board member of the LAMAR Institute and President of the Oglethorpe County Historical Society. Tom has worked for the protection of human burials and was on the committee that drafted Georgia’s burial law, OGA 36-72. In addition, as a governor-appointed member of the Georgia Council on American Indian Concerns since its inception, Tom has provided archaeological expertise in dealing with burial issues brought before the Council as well as assisted in producing information to explain the laws and landowner rights to the public and developers. He has devoted innumerable volunteer hours as an active member of SGA. He is currently serving his second term as Secretary of SGA, having served a 4-year term as board member prior to taking this office and for five years prior to that as Profile editor. During his term as board member, he was instrumental in preparation of the application for 501(c)3 status as well as providing the solution for a permanent address for the organization. As Secretary he has continued to manage the member database, coordinate new member services, and provide support for Early Georgia distribution. Notably, he was the mover and shaker behind the recent acquisition of the Athens Clarke County regional library’s retired bookmobile for refitting as SGA’s archaeology mobile, and secured the $5,000 grant from Georgia Transmission Corporation to cover the cost of getting the bus wrapped/painted! 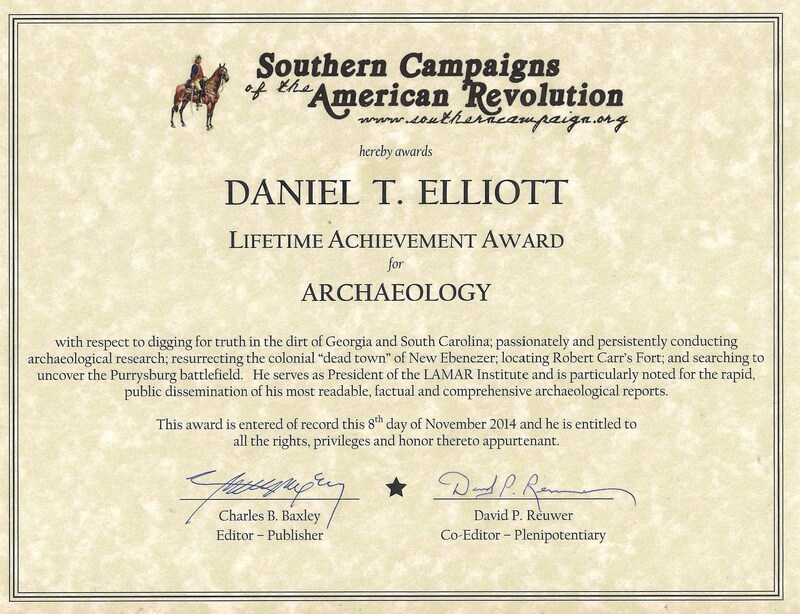 The award, last presented in 2007 to Rita Elliott, reflects the many contributions of Joseph Ralston Caldwell, whose archaeological fieldwork in Georgia and work in the Southeastern U.S. began at the Works Progress Administration excavations near Savannah during the late Depression. He served as Professor of Anthropology at the University of Georgia from 1967 until his death in 1973. The first Caldwell Award was presented in 1990 to long-time SGA member George S. Lewis, followed by Frankie Snow in 1992, Jim Langford in 1993, David Chase in 2000, and Betsy Shirk in 2004. Recent Finds–Jeremy Inlet, Edisto Island, S.C.
May 6, 2008, Rincon, Georgia, Fresh from the beach. Archaeologists have known about the paleontological fossil site at the north end of Edisto Island at Jeremy Inlet since at least the 1960s. The Charleston Museum has fossils from this place dating back to at least the 1820s and possibly earlier. I became aware of this place in 1978 when I first vacationed at the Edisto Island State Park with my colleague Jean H. McPherson. Over the course of the next 30 years, I made numerous visits to that place and surface collected fossils. As a casual visitor, I managed to accumulate a sizable collection of fossils from this site. I have also observed other finds made by friends and acquaintances. The fossil deposit has yielded a rich assortment of Pliocene and Pleistocene fossils. These include both land and marine creatures both big and small. The land animals include mammoth, mastadon, giant sloth, bison, horse, camel, capybara, deer, elk, large cats, various turtles, and numerous small mammals. The marine animals include whales, dolphins, manatees, many species of sharks and rays, drum fish, and numerous other species. Jeremy Inlet also contains an impressive assortment of prehistoric pottery and a few chipped stone tools. The pottery dates to several periods from the Terminal Archaic (Stallings Series and Thoms Creek Series), Early-Middle Woodland (Deptford Series) to various complicated stamped and cord marked types (untyped but probably Middle Woodland through Late Mississippian). The stone tools that I have observed included stemmed and triangular projectile points of Late Archaic through Late Woodland age. The area on both sides of Jeremy Inlet also has a thin veneer of historic artifacts from the late 18th through late 19th centuries, including brick, ceramics, glass, nails, and other metal items, which are mostly the remains of the village of Eddington–a settlement that was destroyed by hurricanes in the 1890s. H.S. Ladd (1939) provides an important discussion of the Edisto fossil deposits in a National Park Service publication. He provides a partial list and several black and white photographs of terrestrial species found as fossils at Edisto by CCC workers in the 1930s. He also offers some interpretations as to the source and taphonomy of this fossil bed. A state park employee reported finding a human long bone on the beach at Edisto Island in the 1970s. The report of this find was published in a brief article in a South Carolina archaeology journal. The current whereabouts of this very important fossil find is unknown to me. 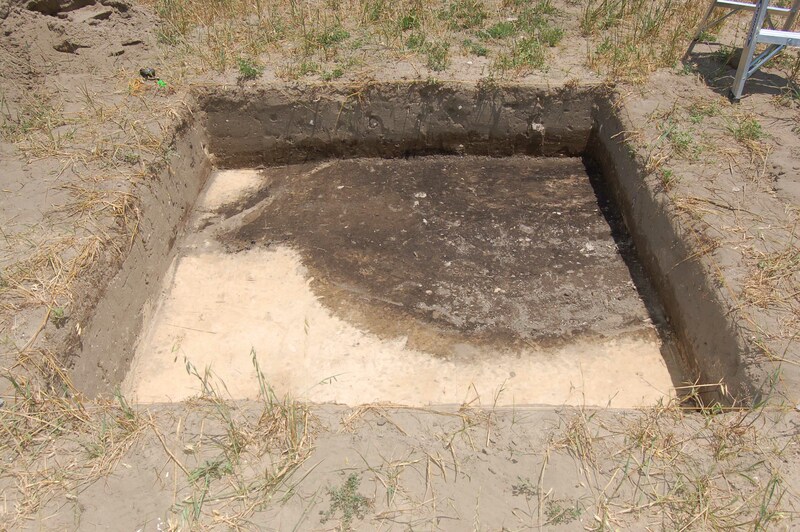 In the late 1970s Paleontologist (and sometimes archaeologist) Janet Roth excavated a small test unit in the marsh at Edisto Island for her M.S. thesis (See Roth and Laerm 1980). 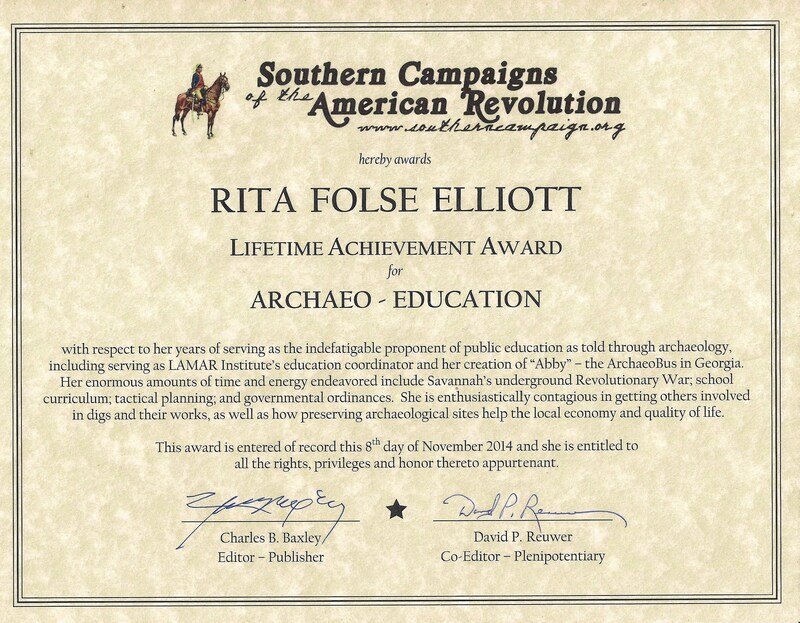 My friend and archaeologist Greg Paulk assisted Ms. Roth in this undertaking. Sanders (2002) contains further discussion of the finds at Edisto Island by Roth and her colleagues. Fossil collectors have been particularly busy at Edisto over the past three decades. Many fossils have been removed from the beach by collectors (including myself) and the ultimate disposition of most of these collections is unknown. Steps need to be taken to compensate for this steady drain on the resource base. The South Carolina Institute of Archaeology and Anthropology has maintained a hobby diver program for several decades and this program partially addresses this issue. Under this program divers who scour the murky bottoms of the numerous blackwater rivers and streams that drain the South Carolina coastal plain are registered with the state. Two recent fossil finds at Jeremy Inlet warrant special mention. The first is a small fossilized (black) fragment of a rib from an unidentified large mammal, which exhibits a “bullet-shaped” drill hole in cross-section. The artifacts has two or more striations, which are oriented perpendicular to the long axis of the drill hole. These striations probably represent marks left by the drill bit as the drill was removed and the drilling residue removed and the drill bit then reinserted into the hole. This artifact was found by Dan Elliott in April, 2008. It was found on the beach surface on the south side of Scott’s Branch at Jeremy Inlet, approximately 50 meters below the high-water dune margin. Two photographs of this object are shown below (on metric graph paper). Close-up view of possible Paleoindian bone tool, showing drill striations. The other important find was a section of cranium (skull cap) of what appears to be a Homo Sapien Sapien. This item has been fossilized and is light chocolate brown to medium brown in color. It contains several parallel cut marks on its surface, which may be intentional. While this skull is petrified, it is not as discolored as most of the fossil bones from Edisto Island. This artifact was found by a local resident of Edisto Island, who has been actively collecting fossils and artifacts from Jeremy Inlet for the past five years. Her collection was briefly examined by Dan Elliott in May, 2008. 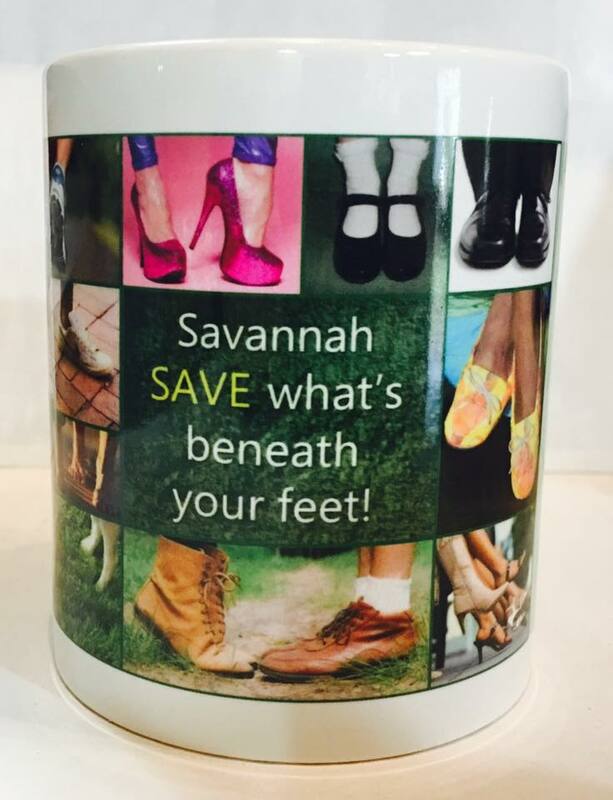 This collection also contains many Stallings and Thoms Creek pottery sherds, as well as later wares. Roth, Janet A., and Josh Laerm, 1980, A Late Pleistocene Vertebrate Assemblage from Edisto Island, South Carolina. Brimleyana 3:1-29. Sanders, Albert E., 2002, Additions to the Pleistocene Mammal Faunas of South Carolina, North Carolina, and Georgia. American Philosophical Society, Philadelphia, Pennsylvania. Palmetto Bluff, near Bluffton, is a swanky place. On the community’s 20,000 acres, you’ll find plenty of stunning scenery, not to mention elegant homes, a spa, tennis courts and other trappings of modern affluent living. It’s been highly-prized land for a long time, Mary Socci reminds us. 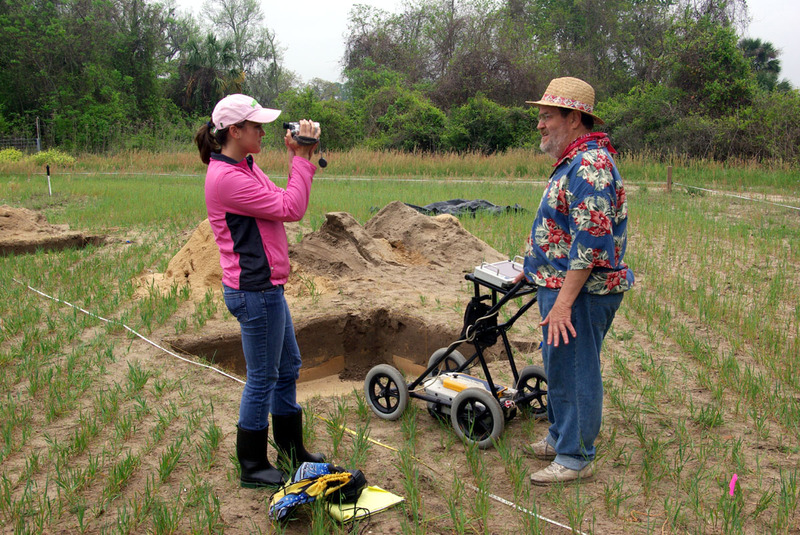 Socci is Palmetto Bluff’s archaeologist. 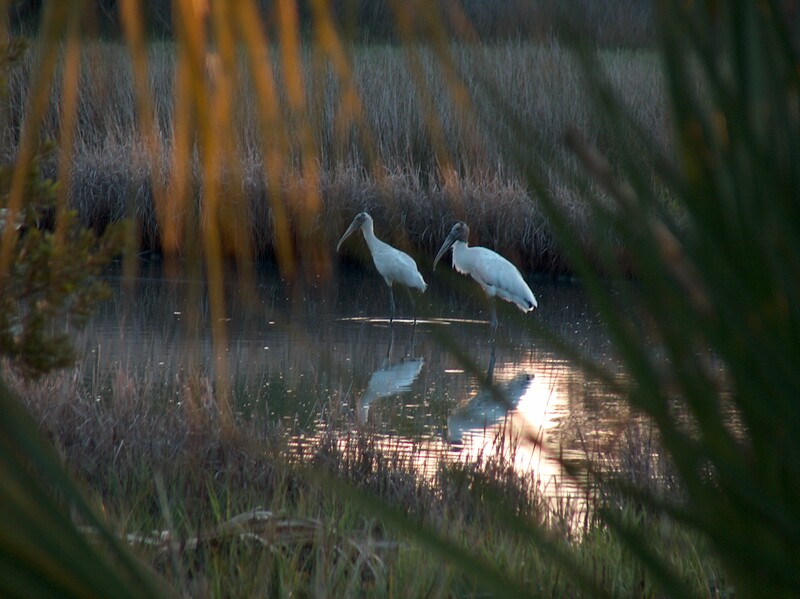 In 2004, Palmetto Bluff contracted with Integrated Archaeological Services to dig into the area’s rich history. The community is in its “second phase” of construction, with much of the area still undeveloped. Working alongside a team from IAS headed by Ellen Shlasko, Socci and her staff have spent the past several years finding and recording the area’s historical and cultural sites. Federal and state laws require developers to document such sites before they build on the land. The search for the sites often isn’t easy. Theus Plantation, for example, was once a 1,000-acre working farm in the area. Early written records are vague, but a British sea captain owned the property in the 1730s. James T. Theus bought the property in 1830; he raised livestock and harvested corn, peas, beans and cotton on the land. Obviously there were structures on the estate, but archaeologists haven’t been able to find them. Their only clue was a series of faint fence-post holes. Among the numerous artifacts that have been discovered are handmade nails, animal bones, pieces of ceramic, buttons made from bone and glass. The items were crafted over millennia; the area has been inhabited, Socci said, since at least around 2000 B.C. The real story of the Theus Plantation era is found a couple of feet below the field’s surface. What the archaeologists needed was a gizmo that could see through the soil and tell them what might lie underneath. Dan Elliott, fortunately, has such a machine. 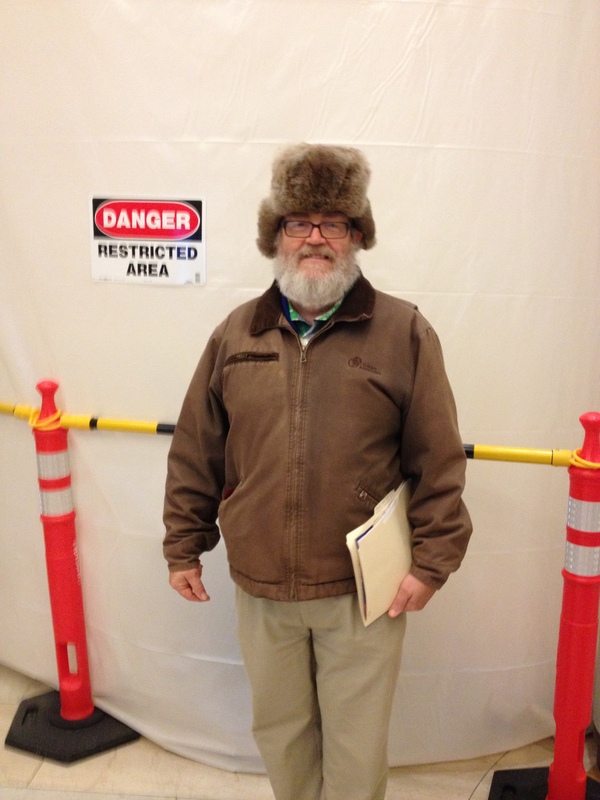 Elliott is a research archaeologist and president of the Savannah-based LAMAR institute. Since 1982, the nonprofit group has conducted archaeological research across the Southeast, embarking on such wide-ranging projects as a study of the Oconee River Valley’s aboriginal mound sites and a survey of previously unstudied colonial period settlements in Georgia and South Carolina. Elliott owns ground-penetrating radar equipment that sends pulses underground and detects “bounce-back” signals. His GPR machine, resembling a lawnmower with a computer screen atop it, can show and record objects up to 6 feet below the surface. With the device, he can detect foundations, walls, wells and small artifacts without disturbing the soil. One day in April, Elliott donated his time and his machine to Palmetto Bluff, helping Socci and Shlasko unearth Theus Plantation’s long-buried secrets. In a few short hours, he detected underground post holes and what might be a well. Both would indicate structures, possibly even a house, on the site. On a recent warm day, archaeologists JaColeman Hutto and Jessie Lerson carefully scraped away at the earth, exploring the spot where Elliott thinks he detected a well. About 30 sites of possible historical and cultural importance have been found at Palmetto Bluff, Socci said. “About half of them are Native-American sites; the others are plantation sites.” Her archaeologists, she said, are “down to the last few sites” requiring excavation. The thousands of artifacts gleaned from the sites are being stored for future study by researchers; some are already on display in the community’s museum. Many of Palmetto Bluff’s residents, Socci said, have shown a strong interest in learning about the area’s long history. “It’s a fascinating place,” she said. The true test of GPR is excavation, and Ellen and her crew tested several GPR anomalies that I recommended for study. The results were very good, in that the GPR anomalies proved to locate cultural features. Some were a little boring maybe, but cultural features none the less. Above is one of the GPR maps. Note the row of circular anomalies at about 20 m north. Below is what was located in the vicinity of one strong circular anomaly, which was located at about 20 m north and 23 m east of the 0 0 point.